The revetment has gone in to protect an oak tree on the bank that has started to lean across the stream towards the path, keeping the habitat in place for creatures such as bats and to prevent it falling onto the path. It’s only real support were bricks that had been left in place since our first task to remove all the MOD debris and these were now beginning to wash free! 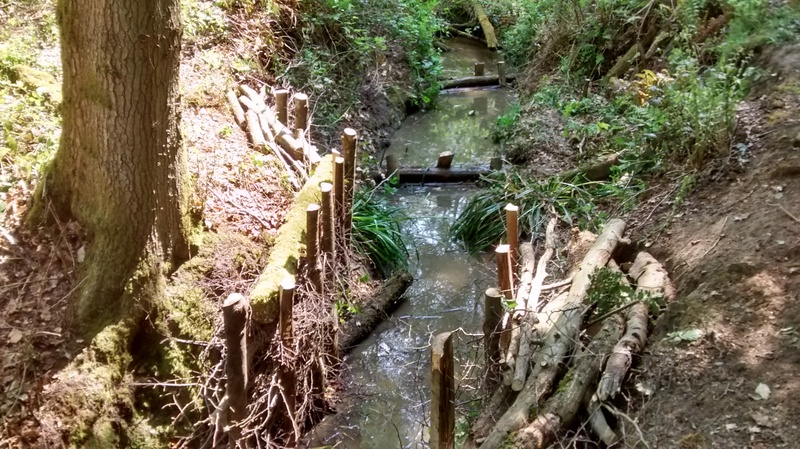 We put a revetment in at the other side to prevent the path being undermined as well as dams further upstream to slow the flow of water and create deeper pools for wildlife. Sedges were planted in areas to help stabilise the loose soil and bind it together for a longer lasting bank. Whilst most of us got wet, muddy (and hot! Waders don’t breathe!) David and Tony headed off with our saw-on-a-stick to the single firing wall on site to remove dead wood overhanging the path. This will help lighten the load on the tree limbs and help prevent it dropping the dead wood onto people passing below. Thank you to all our volunteers. As usual they work hard even whilst being nibbled alive. 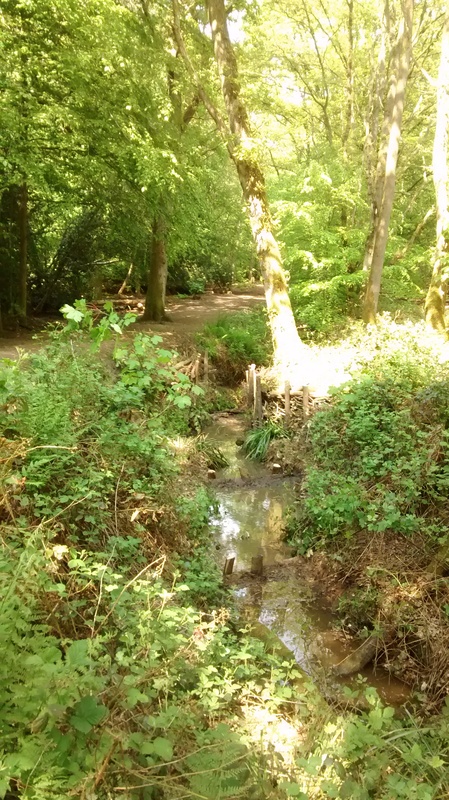 This entry was posted in Conservation, Volunteers, Wildlife and tagged BVCV, revetment, Rushmoor Bottom, stream, Tuesday Volunteers, Wellesley Woodlands. Bookmark the permalink.